Cleotilde Gonzalez, research professor of decision science and founding director of the Dynamic Decision Making Laboratory, has been elected to the 12-member governing board of the Cognitive Science Society. "Psychological research on human adversarial behavior is necessary to uncover factors that determine how deception and phishing strategies originally manifest in phishing emails." Researchers probe psychology behind phishing attacks. What makes the difference between a successful phishing attack and an unsuccessful one? Researchers Prashanth Rajivan and Cleotilde Gonzalez discovered substantial findings while analyzing what phishing strategies are used and how they are implemented. Phishing attacks: Researchers identify how criminals’ strategies may lead to success or failure. Prashanth Rajivan and Cleotilde Gonzalez present a new methodology to study the important but often ignored aspect of phishing: adversarial behavior. CMU researchers are building a model to predict human behavior. Christian Lebiere, Coty Gonzalez and David Plaut are developing the simulation for the SocialSim project which aims to create an accurate, scaled simulation of online social behavior. The project is funded by a $6.7 million grant over four years from the Defense Advanced Research Projects Agency (DARPA). The Defense Advanced Research Projects Agency (DARPA) has allocated more than $6.7 million to a team of researchers, including Christian Lebiere, Coty Gonzalez and and David Plaut from Carnegie Mellon University, to fund research into improving the understanding of how social information travels and transforms online. Behavioral scientists Cleotilde (Coty) González and Nancy Cooke are part of a major new research effort to study the psychology of deception in order to counter Advanced Persistent Threat attacks. Using psychology and decision making to study cybersecurity, Prof. Gonzalez was mentioned in the MURI Grant News. Prof. Gonzalez gave a talk at the 2016 NIST Forensics on the human factors of forensic sciences and identification decisions. Check out the last video for Prof. Gonzalez’s talk. Social Sciences at CMU are ranked #19 by The Best Schools.org based on Shanghai rankings. Dynamic Decision Making Laboratory is mentioned. U.S. Army Research Laboratory and Carnegie Mellon University are pursuing a novel way (STIDS) to use technology that eases the detection burden on analysists that monitor networks around the clock. Dr. Jason Harman, a psychological scientist with a background in human decision-making has joined the faculty at Louisiana State University, Baton Rouge campus. Cleotilde (Coty) Gonzalez has been selected to serve on the Human Factors Committee of the Organization of Scientific Area Committees (OSAC) within the U.S. Department of Commerce's National Institute of Standards and Technology. NIST Names Members of Forensic Science Resource Committees: The Human Factors Committee will provide guidance throughout the OSAC on the influence of systems design on human performance and on ways to mitigate errors in complex tasks. Researchers at Carnegie Mellon University are part of a collaborative research alliance led by Penn State University that has been awarded a ten-year, $48.2 million collaboration by the Army Research Laboratory to develop a new science of how to make security-relevant decisions in cyberspace. Key to protecting online operations is a high degree of "cyber security awareness," according to human factors/ergonomics researchers Varun Dutt, Young-Suk Ahn, and Cleotilde Gonzalez. It turns out that a lot of people make this kind of mistake. Difficulty understanding stocks and flows may be a fundamental cognitive error such as anchoring or availability bias. In one experiment by Matthew Cronin, Cleotilde Gonzalez, and John Sterman, more than half of a group of students at MIT Sloan - one of the top business schools in the country - could not figure out, from a chart of entrances to and exits from a department store, when the most and fewest people were in the store. Cleotilde (Coty) Gonzalez, an associate research professor of social and decision sciences that studies conflict resolution from a behavioral and computational approach, spent five days working with the Peres Center for Peace in Israel looking for an answer. Twenty-two different teams participated in the competition. The total number of submissions was 25. The winners are Wei Chen, Chih-Han Chen, Yi-Shan Lee, and Shu-Yu Liu from National Taiwan University. The runners up are Tomas Lejarraga, Varun Dutt, and Cleotilde Gonzalez from Carnegie Mellon University. Researcher receives $6 million to study cyber awareness: Liu and his team received a Multidisciplinary University Research Initiative Award (MURI) for his project, "computer-aided human centric cyber situation awareness." They plan to use the grant funding to further the research on cyber awareness and how it can be used to improve cyber defense. Cleotilde Gonzalez, associate research professor in the Department of Social and Decision Sciences and director of the Dynamic Decision Making Laboratory, recently spoke to a large group of faculty in computer science, psychology and management at the Wyzsza Szkola Biznesu (National-Louis University) in Nowy Sacz, Poland. The first presentation was made by Varun Dutt on a paper titled Human Perceptions of Climate Change, co-authored by Cleotilde Gonzalez. Both are from the Dynamic Decision Making Laboratory at Carnegie Mellon University, Pittsburgh. One of the main hypotheses which guided their study was that human negligence towards issues affecting the climate system is a result of human cognitive inabilities. As the granddaughter of Palestinian Prime Minister Mahmoud Abbas, senior business administration student Hala Abbas has intimate knowledge of the inner workings of the Israeli-Palestinian conflict. Yet she faced many challenges while playing PeaceMaker, an educational video game inspired by real events in the Israeli-Palestinian conflict that challenges players to succeed as a leader on both sides. A Carnegie Mellon University professor is using the PeaceMaker video game - which calls on players to resolve the Israeli-Palestinian conflict - to study how a person's background and knowledge of the conflict influences how they negotiate a solution. On the global well-being front, a Carnegie Mellon University professor is using the PeaceMaker video game, in which players attempt to resolve the Israeli-Palestinian conflict, to examine how knowledge of the conflict affects the ways that people negotiate. 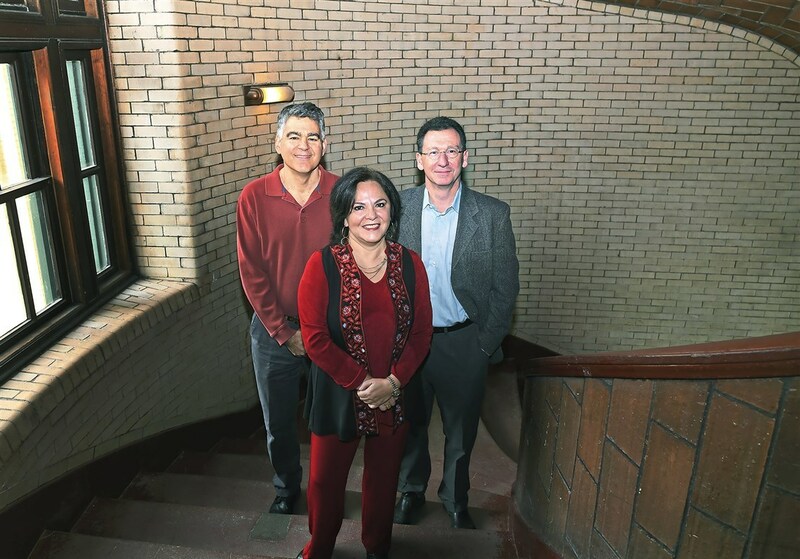 Spanish-language publication featuring a profile of Prof. Cleotilde Gonzalez. Foreign-born professors come and stay at CMU: Carnegie Mellon University draws its pool of talent from all over the world. Many of the most well-known and respected professors at the University are originally from a foreign country. Students in the College of Humanities and Social Sciences' Information Systems program spent the fall semester donating about $1 million of their expertise to help non-profit agencies create computer systems that will enable them to provide needed programs and services. CMU brain power boosts charities: Professor Cleotilde Gonzales, who taught the course, estimated that the students donated about $1 million in time and work to the participating nonprofit groups, which included North Hills Community Outreach, the Pittsburgh Zoo & Aquarium, Operation Safety Net, Light of Life Ministries and Fallingwater.